There is a superficial similarity between vacuum filling pens and the stick type of piston filler; a long thin rod moves an internal disc up and down. However, the operation of vacuum fillers is somewhat counter-intuitive and borders on magic– push the rod down, and ink rushes in to fill the barrel. This trick is managed by using a scheme which is sort of the flip-side of that employed in pneumatic fillers. The thin disc acts as a valve, allowing air and ink to pass only towards the point. Pull the stick up, and the disc passes through whatever is in the ink chamber more or less freely. 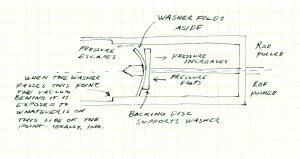 Push it down, and the disc seals against the walls, forcing out whatever is on the point-side of the chamber. 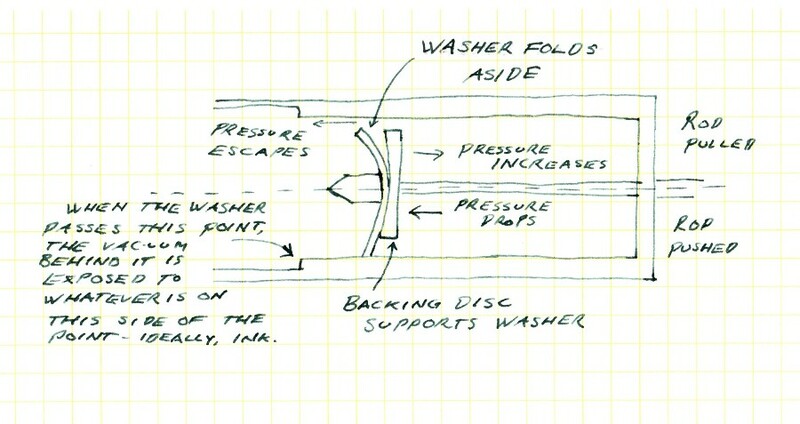 On the tailward side of the disc, this action generates a partial vacuum, as it is increasing the volume on that side without allowing more air in. At the bottom of the chamber, the walls widen out, and the vacuum draws in whatever the point is currently in– during this operation, that usually means ink. Vacuum fillers have a number of admirable traits. They are simplicity itself to operate, and have very few moving parts to wear. They have a vast capacity relative to the size of the pen, which Sheaffer kindly allows us to examine through having made to same models in both lever and vacuum filled versions; the Balance Craftsman, for example, carries an extra 50% volume in the vacuum version. They also tend to keep their feeds clean through the sudden agitation and high pressure of fluid through the channels. Pressure is also, though, the downfall of the vacuum filler. To work at all, the space between piston disc and tail must remain air-tight, but to be workable at all there must also be a hole in the tail for the driving rod to pass through. This calls for some very clever seals in the tail of a pen, something like the stuffing-box on a boat’s propellor shaft. It must be a much smaller item, of course, and in being small becomes less able to resist pressure. I mention earlier that the valve effect of the sealing disc more or less allows things to pass towards the pen’s point– rather “less” than “more”, as it turns out. The clearance is very small, and if the rod is drawn up briskly, this causes pressure to build up between the disc and the tail. While the gap is still the most available means of relief, the pressure generated will also compress the tail-seals, and this is a serious source of wear on the mechanism. The most common failure in a vacuum-filling pen is in the tail, and it is also a bit of a struggle to put right as most makers were not making these pens with an eye towards future repair. The piston seal itself is the other point of failure. While a “moving part” only by dint of sliding up and down the inside of the barrel, there is some effect upon it of both friction and flexing. It can wear, and as it is usually made of rubber it can also have its flexibility reduced from prolonged contact with ink. Most vacuum-filling pens hold the ink in the barrel itself, another point of commonality with piston filled models, and this of course leaves them open to issues of thermal expansion in the same way as those and eyedropper pens. Those made by Sheaffer in the 1940s had both a complex feed and a separate interior ink chamber, and are extremely reliable in terms of ink flow, but other earlier models occasionally grow whimiscal. Modern pens using this system usually also have a developed enough feed that dribbles are not a concern. A final point of similarity between piston and vacuum pens is that the ink chamber will not be completely full of ink after the operation of the filler. This is for much the same reasons of swept volume versus total interior volume, but in the case of the vacuum filler there is no overcoming the “deficit” by a re-working of the filler. Remove cap from ink bottle and pen. In the majority of models, this is a false blind cap, and is permanently attached to the rod; don’t pull it out just yet. In some models, the blind cap conceals an unattached rod, and may be laid aside. Hold pen over ink and gently pull rod to full extention; try draw the effort out over at least 3 and ideally 5 seconds, to save pressure wear on the tail seal. If the pen was not empty, there is apt to be a spurt of ink from the point at the the top of the stroke (if there’s a spurt of ink at the other end, your seals are bust). Press down the blind cap, being careful to not drive the point into the bottom of the bottle. This action should be pretty brisk, to avoid loss of vacuum through slight imperfections in the seals. There should be a burbling of expelled air in the ink. Remove the point from the ink, wipe point and section (aren’t you glad you did step 1? ).